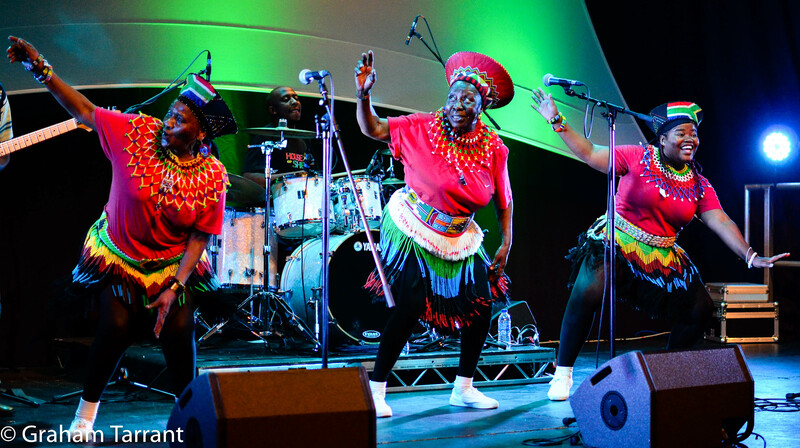 Prior to their appearance at Womad Festival, the Mahotella Queens came to Salisbury with their colourful African beats. Mixing high energy rhythms with uplifting funky harmonies, it was a pleasure to witness the beauty of the performance. 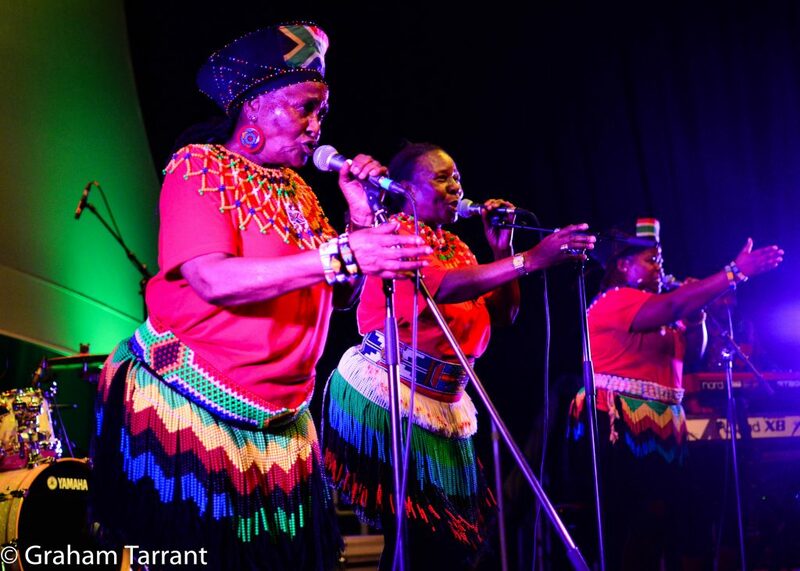 New artists arrive all the time at the arts centre, but the three Queens were formed back in 1964 and must surely be one of the oldest South African groups still performing. While many original members are no longer with us, the newest member Amanda Nkosi joined the group when original member Mildred Mangxola was forced finally to retire. At a mere 29, Amanda was humorously mocked that she wasn’t even born when the band first took to the stage some 50 years earlier. She was even challenged whether she could keep up with the 69 and 90 year olds eclectic dancing, making the Rolling Stones look like geriatrics nailed to the floor. Some of their moves gave a whole new definition to break dancing –what they lacked in choreography and panache, they more than made up for in energy and passion. With the crowd initially scattered on tables throughout arts centre, the trios infectious beats ensured the crowd were all up on their feet dancing by the time the party had finished. The brave pioneers in audience who took to front of crowd were invited on to the stage to show anyone must be nailed to floor if they didn’t shake their booty with the Queens. Transcending cultural barriers, their lyrics and political messages remain true today, calling for a freedom in the struggle for equality, while acting as a positive celebration of diversity. Simply by recognising where there are differences, they were persuasive that it only makes us all stronger and enriched. 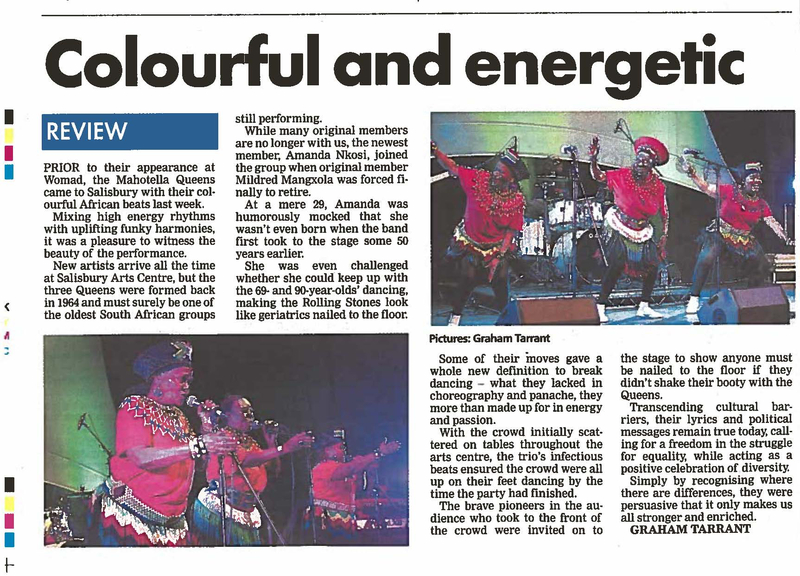 This entry was posted in Mahotella Queens and tagged Mahotella Queens, Salisbury Arts Centre.